a being to be protected, to handle with care. not be able to trust yourself anymore. Lost any basic energy, all the feelings that make you feel alive are blown away. Chiara’s gaze was lost in dark thoughts, locked in a solitude that seemed unreachable. My fashion shots brought us close together. Chiara found them beautiful and felt she could trust me, that I would have helped her protect herself, that I would always have been regarded with affection and respect. The bond between us developed and grown around psychiatry wards, eating disorders treatment centers and brief returns home; from unfamiliar rooms to windows with security bars, watching distant skies. I sent her letters, images of wide open skies and deep blue seas. 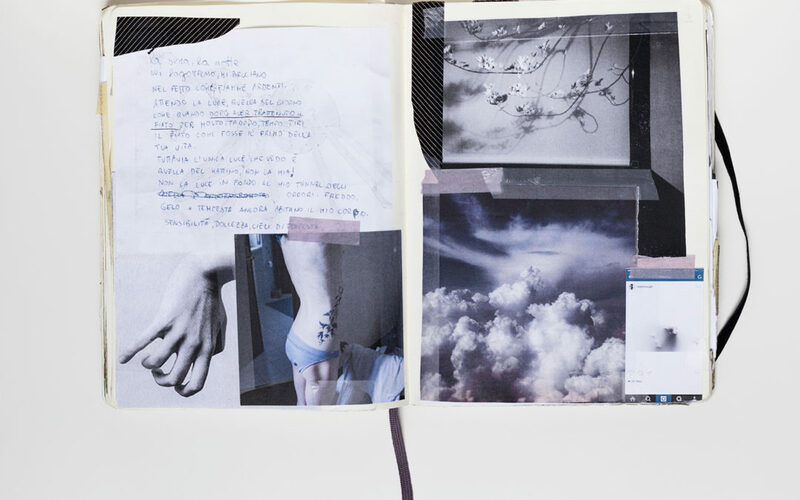 It was then that I decided that our shared experience would not have been relegated to a documentation: collecting visual thoughts in a touchable diary I found out a way to have an interaction with Chiara, built up a conversation not made by words, but feelings and images. It would have been my best gift to her. Chiara is one of the many Millenials on Instagram. The 53 percent of the users. She used to change her own account description every two months. Clairenough’s selfies were full of flowers; she posted them tirelessly on her page, in a continuous need for attention; tightened by the place where anorexia constantly brings you in. You are hungry for the consideration of the others. ”My shoes first, then I”, she wrote within a spreading sea of images, taken from the internet and of herself, in an ambiguous and perturbing game, between seduction and arms crossed, marked by IV drips and plasters. Chiara’s images appeared as she wanted to behold herself. Chiara handed in her own fragility and beauty to the phone’s screen; amidst blossoming and withering flowers, black nails and green then blue hair, perfectly made-up eyes pop out. Her body seemed to be no longer hers: it was a kind of mannequin, the way in which Chiara alienated herself and offered a great visibility, in the uncertainty of a semi-life. She found herself trapped by a generational condition: her constant desire to be different made Chiara always look at fake archetypes of feminine beauty; she was just asking for attention. A dead body is what she found. There I figured out how Chiara really was, not Clairenough. Sick Sad Blue is not just a relationship of acceptance and trust that unfolds between letters with tiny hearts, meetings and greetings, hugs and many taken photographs, sent using mobile phone, posted and shared on Facebook and Instagram. It pretends to be the healing diary of a person who became a close friend. It is our story.